Steak Diane is an American dish of a pan-fried beefsteak with a sauce made from the seasoned pan juices, generally prepared in restaurants tableside, and flambéed. It was popular in the middle of the 20th century, but was considered dated by 1980. "Steak Diane" does not appear in the classics of French cuisine, and was probably invented in mid-20th century New York as part of the fad for tableside-flambéed dishes. The name 'Diane', the Roman goddess of the hunt, has been used for various game-related foods, but the "Venison Steak Diane" attested in 1914, although it is sautéed and flambéed, is sauced and garnished with fruits, unlike later steak Diane recipes, so it is unclear if there is a connection. By the 1940s, Steak Diane was a common item on the menus of restaurants popular with Café society, including the restaurants at the Drake and Sherry-Netherland hotels and The Colony. It is often attributed to Chef Beniamino Schiavon, 'Nino of the Drake'. Steak Diane is similar to steak au poivre. 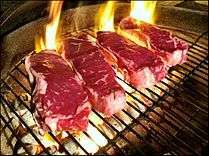 The steak is either cut thinly, or pounded thin so that it will cook rapidly. It is seasoned and quickly sautéed in butter. A sauce is prepared from the pan juices. Ingredients vary; they may include butter, mushrooms, mustard, shallots, cream, truffles, meat stock, A1 Steak Sauce, and Worcestershire sauce. The sauce is flambéed with brandy or Madeira and the sauce poured over the steak. ↑ Florence Fabricant, "New Wave in the East River: David Burke", New York Times November 9, 1988, characterizes it as "retro"
↑ Jane Nickerson, "Steak Worthy of the Name", New York Times January 25, 1953, p. SM32, as quoted in Olver, Lynne (2000). "Steak Diane". History Notes. The Food Timeline.